How much time do you waste shaving, plucking, and tweezing unwanted hair? 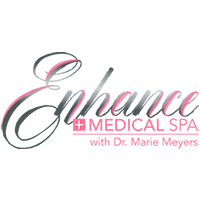 Let Dr. Marie Meyers at Enhance Medical Spa in Cincinnati simplify your life with laser hair removal on almost any area of the body. Feel comfortable knowing that an experienced doctor is doing all your treatments. To learn more about laser hair removal, call the office or book online. The laser damages hair follicles so that further hair growth is either greatly diminished or else prevented altogether. Dr. Meyers uses a state-of-the-art Cutera machine which is safe for all skin colors. Only dark hair can be effectively treated because blonde, grey, white, or red hair does not contain enough pigment to be visible to the laser. You should avoid sun exposure or self-tanners for 4 weeks before treatment. Ideally tan lines should be faded for best results. You should also refrain from waxing, bleaching, or tweezing during that same time period. Then hair should be shaved before arrival, either the night before treatment or that same day. A cool gel is applied to ensure maximum patient comfort. Then most people describe a sensation similar to the snap of a rubber band as the pulse is delivered. Since only 20% of the hair follicles are in the active growth phase at any one time (and thus the most susceptible to damage), usually 4-6 treatments are necessary. Darker skin often requires 6-8 treatments. The interval between treatments is typically 6 weeks, but may be longer with final treatments. Patients are pleasantly surprised at the comfort of the treatment, and are thrilled to finally be rid of unwanted hair. The most common remark Dr. Meyers hears is, “If I had known how easy this was, I would have done it a long time ago.” Get started now by calling Enhance Medical Spa today or booking online.